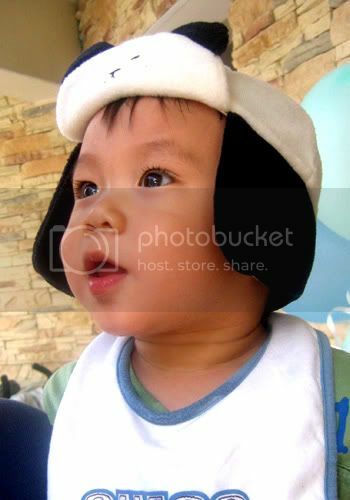 @Chloe's birthday - A mummy's inane blabberings..
Aidan's so into wearing hats now. He simply refuses to take it off even when he's perspiring so much in the heat.. 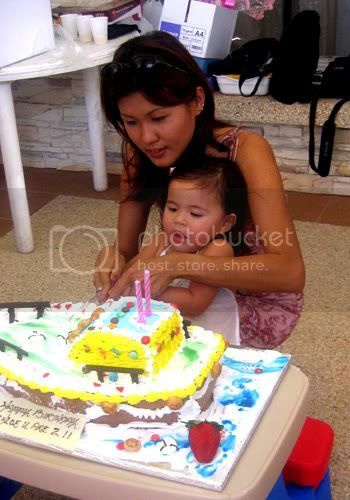 Here's the pics taken at Lina manichon's babe - Chloe's 2 year old birthday party. 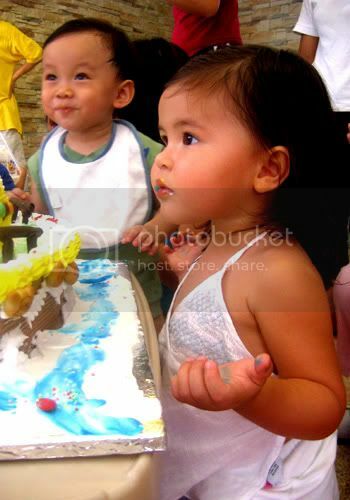 Aidan definitely enjoyed himself..he ate so much and had so much fun with the activities that Lina had planned for the li' kiddos and best of all, he enjoyed the food especially the birthday cake. Can't write much since I'm at work (it's lunch break) so just loads of pics to show! my li' boy couldn't tahan anymore and attacked the big red strawberry! 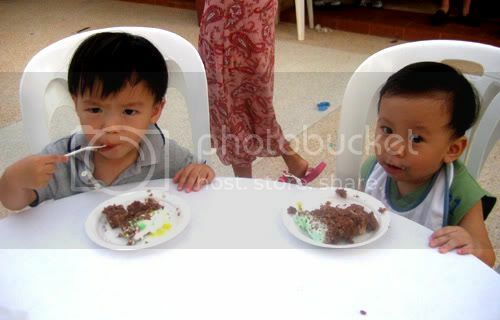 the 2 boys enjoying their cake~! 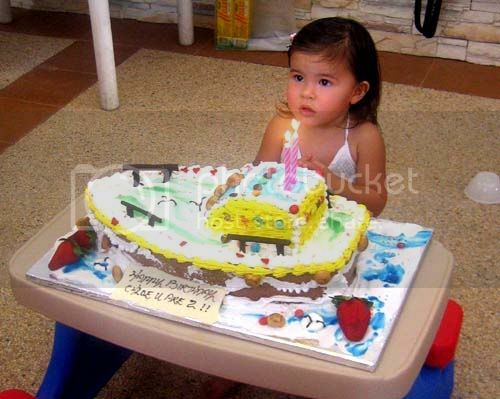 another pic of chloe from her mommy's cam..
Chloe is SO PRETTY! And Aidan looks so cute! AND you are so much slmmer! Netball training right? :) All of you looked great! 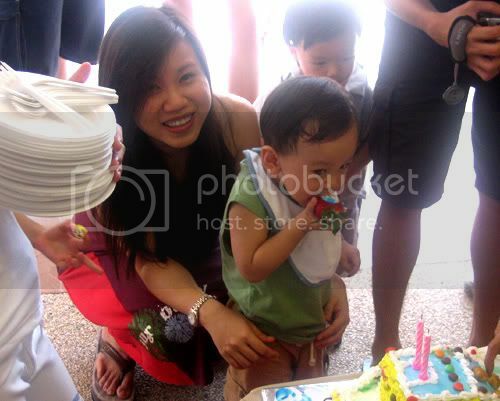 Aidan looks happier than the birthday ger beside the cake ! lol. haha! U noticed! Can see the glee in his face hor..He's thinking.Makan time!! Haha! When I saw the first pic, I was wondering whose little princess is it. and aidan heh.. i think he's startin to look like you. heh dunnit to make me feel better lah. 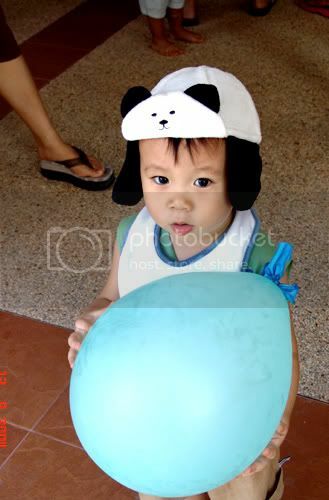 :D..
*squeals Aidan reminds me of one of those Japanese cartoon doog. kawaii yo! You look so cute in the pix with Aidan attacking the strawberry. Aiyoh... check out Aidan's curly eyelash! Can fight with Megan's one... Macy no fight with that. waliao..spend such a long time to lose weight and gain it all back?!! Cannot lah! yeah lor..love his lashes.Dunnit mascara and eyelash curler! I wish my lashes were like that man..But Megan's one definitely longer n curlier! Hanor..u check out the latest chloe pic i posted..really pretty! I love the pix of Aidan with the strawberry, so natural and cute!!! LOL! hehe..i like the strawberry pics coz it's so spontaneous..(and so him *sigh*).. 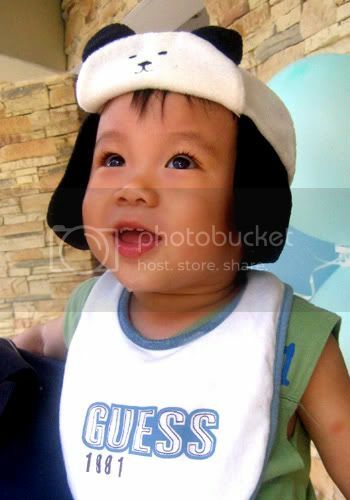 I love his hat, where did you get that? Caleb is also very vain, loves to wear hats, but I always got problem buying, cos' his head is pretty big, so harder to be nice ones. Really love his curly eye lashes... definitely looks more like you in all these photos. My sil bought the hat from Australia! 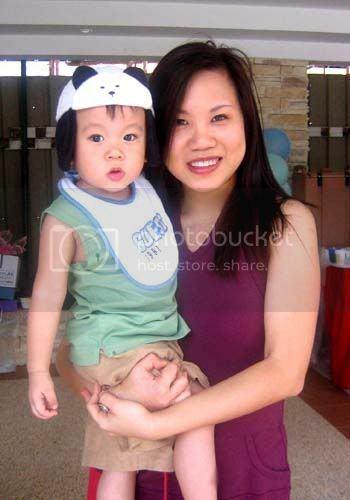 I think it's a winter hat leh..
chloe changed a lot since the last time I met her at your place. and yes, aidan does look like u more. got change alot meh? I think just that her hair's longer! 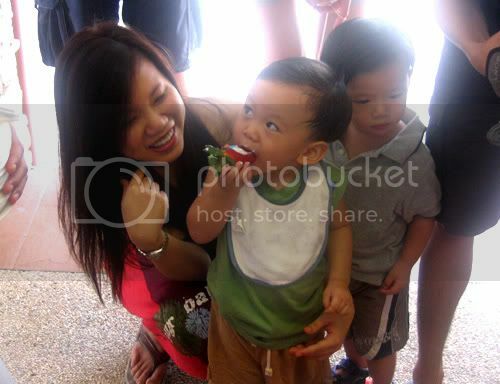 So look more babe liao :D..
Aidan's so soo cute! And as tam chiak as ever! *hee* And I lurve the birthday gal's cake!!! Hey, get the lil' fella baseball caps. Wear them backwards even. Macho lah. Chicks dig them too ... um, I mean chicklets of coz. Heheh! heh got lah! 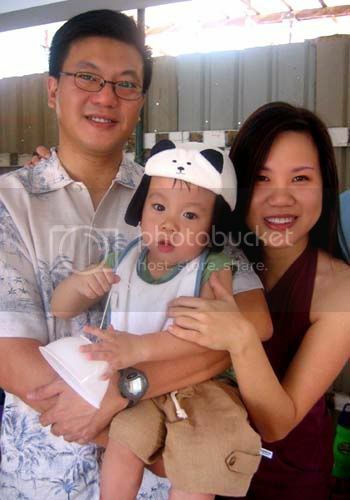 The problem with baseball cap worn backwards is that when he sits in the carseat, it cant keep still and he will fret coz it drops off ..
And yeah, I think Aidan looks more like you than YC. hanor..we are watching his diet lah.If don't control, he probably will become a this rotund li' creature soon. Aidan still looks very chubby .. and cute! esp in the hat pix! And that greedy grin when he gobbled that very huge strawberry! Does every kid given a hat or something? yeah..Nenita made sure she fattened him up again (which wasn't a tough thing to do)..
Nope..that's Aidan's hat..my sil bought it for him from Australia..
You have definitely gone slimmer! Great job! Aidan's gonna be a heartbreaker when he grows up ... so good-looking u know? Esp those eyes! But i do love his eyes & lashes. His lashes are longer than mine man! I like Aidan's complexion. very tanned and very smooth! I wish I have skin like that and hey! Chloe is very chio! actually Aidan is very fair irl..he looks tanner coz of my photoshopping :P hehe.. But yeah..i love their complexion. So smooth!